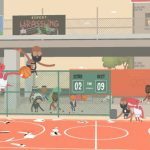 If you’re looking for a more casual basketball gaming experience on your iOS device, you might as well give Battery Acid’s Baller Legends a try. In this game, you’ll be creating your own player, as you guide him from the early stages of his career as a rookie, until he becomes a legendary player in his own right. There are a couple modes to choose from, including Arcade Mode, where you go for as many shots as possible until you miss three, and Challenge Mode, where you’ll be completing certain objectives and unlocking new gear and clothing. You can also collect different basketballs and power-ups that could improve your game. It can be tough to become a big success on the hardcourt if you aren’t prepared, so we’ve come up with a few Baller Legends cheats, tips and tricks that could speed up your progress from rookie to legend. All in all, the most challenging thing to do here in Baller Legends is to master the visual clues for each shot. 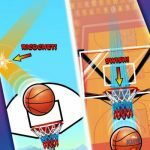 For instance, if you’re aiming from the free throw line, you should swipe your finger in such a way that it starts from your player’s elbow, and stops at the bottom of the board. Every shot requires a different swiping style, so keep practicing until you get it right – pretty much like if you were a real-life basketball player. If you watch basketball, you probably know that dunks go in 95 to 99 percent of the time, with the only misses happening when the player shows off too much. 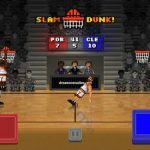 In Baller Legends, dunking can require more practice than you think, and many players do indeed find it difficult. If you miss, you may lose some balls, so make sure you practice your dunks regularly. When taking shots, you’d usually be better off shooting with too little force than too much of it. If you’re just starting out in the game, this will result in a whole lot of airballs, but once you’ve gotten the hang of it, it will benefit you more if you use slightly less power than what’s needed than if you use a bit too much of it. Over time, you’ll be able to unlock new basketballs that can, among other things, improve your accuracy and improve your chances of getting power-ups and multipliers. Look at each ball’s description and choose wisely – these are rather premium balls, which means you wouldn’t want to blow your in-game cash by buying all of them. In most cases, you should be fine with two or three balls. Too much practice in real-life basketball could take away from your game, and so can fatigue in an actual game. Also, frustrated players tend to miss their shots and turn the ball over more often. In Baller Legends, the same applies – too much fatigue and frustration could take their toll. If you’re on a cold streak or feeling a bit mentally tired, take a break of 30 minutes or so, and return to the game refreshed and ready to resume your legendary career path.